"The poems in this fine collection sing of soldiers who return from the wars, stricken revenants from Grant to the poet's father. 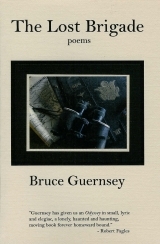 Bruce Guernsey has given us an Odyssey in small, lyric and elegiac, a lonely, haunted and haunting, moving book forever homeward bound." 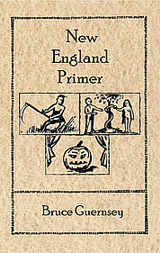 "New England Primer is the best damn book of poetry I've read in a good long while. "Ice Fishing," "The Owl," "Long Distance," "The Compass"—these are poems like nobody else's." "These wonderful, finely crafted poems are deceptively quiet like the landscapes they lovingly depict and the lives they choose to observe with such deep affection. And yet, there is much here that is very dark, and haunted not only by a nostalgia for a lost, more innocent past, but by what Robert Lowell calls 'the dark downward and vegetating kingdom/of the fish and reptile.' The unconscious is very much alive in these poems, which is to say, they delve into areas of human experience that can sometimes freeze you to the bone like diving into a perfectly calm, New Hampshire pond in early spring." "Bruce Guernsey's truths are important. His very human poems--so often about innocent things like fishing, splitting wood, or simply walking--reveal another world where an owl's eyes become a hangman's, or God, a swaddled, illegitimate child. These discoveries are even more disturbing because they come from words so clean and direct." "Bruce Guernsey knows the rhythms we move to when we're alone, and he lays them down around us in his lines. He's a sharp-eared craftsman, with a feel for such elements of poetry as line-breaks and resolution and the five-stress beat that comes through the skillfully casual diction as a continual and good surprise. Here is a poet." 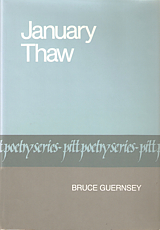 "These poems are minimal to the eye only. Guernsey's method is to focus on the character of an elemental object until he invests it with associations that enlarge it, you might say historicize it: a chopping block...becomes the pillow for a beheaded emperor, a shelf of thumbs from centuries of thieves, a setting for the sacrifice of Isaac by Abraham—and these in a few terse lines.... Guernsey is a spook, warming his hands over a spit-stove."